Parthasarathy is from a single-parent family. His father is working as a daily-wage labourer but is not willing to support the family. Parthasarathy and his sister were left in the care of their aunt, who herself is a labourer and can hardly afford to take care of the children with her minimal earnings. That's when he came under the care of Isha Vidhya. The scholarship helps him pursue his studies and gives him a chance to fulfil his ambition of becoming a police officer.He is an active kid who completes his work much quicker than others. He is very attentive in Math classes and always raises his hand to give answers across all subjects. There are many like Parthasarathy who is struggling without support from parents. Despite considerable economic progress in India in the last couple of decades, poverty has continued to pervade rural areas. However, with access to education, youth in rural areas can be empowered towards wellbeing and contributing to the country’s development. Most children in rural areas can only afford Government schools. With schools lacking basic facilities, facing teacher shortages, having unmotivated or frequently absent teachers and a pedagogy heavily focused on exams through rote memorization rather than learning, even those who eventually make it through twelve years of schooling graduate lack basic skills, making it difficult to seek gainful employment or pursue higher education. All Isha Vidya schools are situated in villages. The parents of the students go for labour work in farming, construction, tailoring, textile, agriculture, fishery etc.Our first school started in 2006 in Santhegoundanpalayam village, Coimbatore.Today there are 9 rural schools (8 in TN in districts of Coimbatore, Erode, Salem, Cuddalore, Villupuram, Tuticorin, Nagercoil & Dharmapuri, 1 in AP in Chittoor Dt. ), creating a bright future for 6,415 children. Many of the students are first-generation school-goers. About 60% of the students are supported by full tuition scholarships. The rest pay a subsidised fee. Actively promote education of female children (46% are girls) by visiting villages & counselling parents of girls to send their children to our schools and by providing proper toilet facilities for girls. Scholarships and fee subsidies are provided to deserving students a comprehensive allocation process ensures that only students truly in need receive this help. Even nominal fees are too much for some rural families. 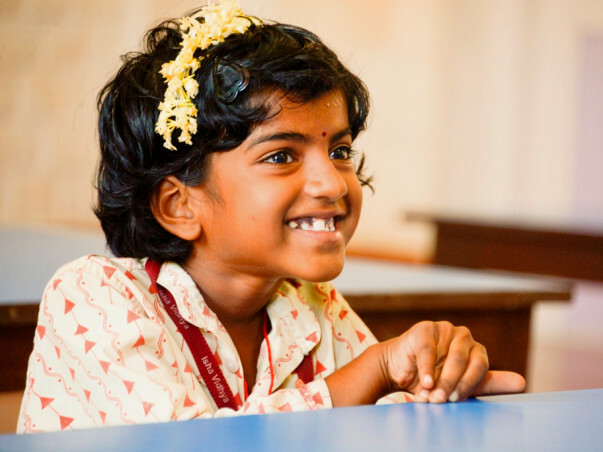 Recognizing this challenge, Isha Vidhya provides scholarships which cover students’ tuition, notebooks and textbooks. 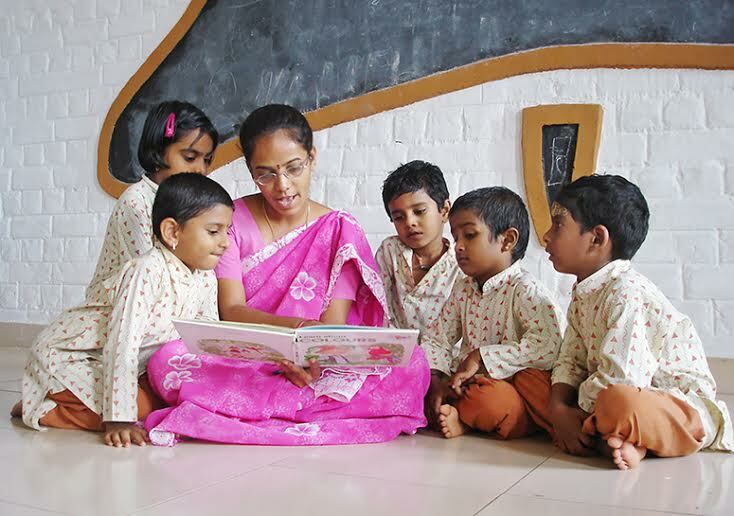 Isha Vidhya schools bring about a significant change in possibilities for the economically underprivileged families in the villages served by the school. They also drastically alter parental attitudes to education, and with it, their hopes and expectations. The schools also bring about infrastructural developments in the area with roads, small businesses and housing developing around the schools. Special efforts are taken to increase the enrolment of girls every year with door-to-door canvassing in the lower income areas of the villages nearby. Parents are actively encouraged to participate and observe their children’s progress by being called to school every term and shown the way their children learn. Clean toilets for boys and girls ensure that there are no drop-outs of girl students after they attain puberty. All these change the mindset of parents and encourage them to become hopeful and expect a far better future for their children. We encourage donors to visit our schools and support our children as mentors. Sponsors are matched with specific students and receive regular updates with photos, letters and progress reports. 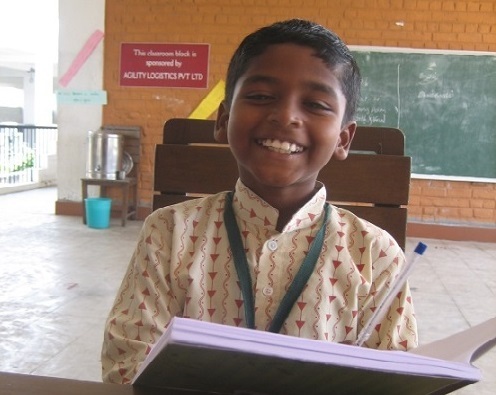 Sponsors are encouraged to support a student for the entire duration of education at Isha Vidhya.